The Curious Incident of the Dog in The Night Time is a novel by Mark Haddon that was published in 2003. It won x prizes. Everybody I knew read it. Everybody I knew really liked it too. I am not very good at reading. The thing I remembered most about the book was that it was printed in the font that is called Arial. My friend Edward said this was because Arial was the most autistic of all the fonts. This The Curious Incident of the Dog in The Night Time that I am writing about is not the novel by Mark Haddon. It is a play by Simon Stephens. Except that is it a play of the book by Mark Haddon, by Simon Stephens. In the book by Mark Haddon, Mark Haddon pretends that his book is actually a book written by the boy in the book, who is called Christopher. In the play by Simon Stephens, Simon Stephens pretends that the play is an adaptation of Christopher-from-the-book's book by Christopher and his teachers. And the National Theatre, where it is on, pretend that it is a play by Simon Stephens. That is what it says on the posters. Really, it is a play made by Marianne Elliot who is a director, and Bunny Christie who is a designer, and Finn Ross who is a video artist, and Paule Constable who is a lighting designer, and Ian Dickinson who is a sound designer and Simon Stephens who is a playwright and and Steve Hoggett and Scott Graham who are a Frantic Assembly. It is also by the actors and the other crew members, because they have all made it together. 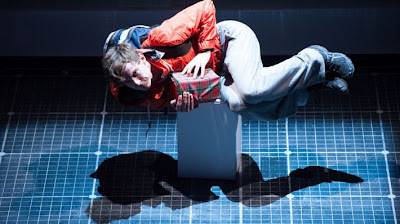 In some other reviews of the play, some people have probably said things like “I thought it was very good the way that Marianne Elliot made Luke Treadaway act so well and told him what to do”. But I don't think the people who say that actually know if it was Marianne Elliot who made Luke Treadaway act well. Or when they say “Bunny Christie's idea is good” whether they know which bit of the idea was her idea and which bits of it were other people's ideas, like the video designer and the lighting designer and the Marianne Elliot, or not. So it is guessing. Which is like lying. I don't know who you are, so I don't know if you have read the book The Curious Incident of the Dog in the Night Time, or if you have seen this play of it. I had read the book, but I read it a long time ago, and I had forgotten a lot of the story, so that might have happened too. Because I do not know if you have read the book, I am not allowed to tell you all the things that happen in the story, because that is called SPOILERS and they stop you being surprised when you see the story. Also, because I don't know if you have already watched the play, I also can't tell you all the things that they do when they are doing the play of the story on the stage because of the same thing. If I can not tell you anything about what happens in the story, or what happens on the stage, it is quite difficult to write about why it is good and why you should go to see it. If that is what a review is for. (It is good, and you should go and see it). It looks very good. The people who decided about how it should look and made it that way decided to make it in-the-round. Normally I don't like theatre in-the-round, because you spend a lot of time looking at other people who are looking at the play. That does not happen this time. It might not happen because of the shape that the Lyttleton Theatre is, or it might not happen because you don't want to stop looking at the things that are happening on the stage. I think it was because of both things. Which means it is good. What it looks like is like a long rectangle of y boxes that are lit from the inside with three doors in it. On the floor there are z little round L.E.D. lights under little circles, that are arranged in a grid of squares. When the play begins, these get lit up in different ways to show you different things in the story; like a room in a house or a constellation of stars that Christopher is talking about. They also use video projectors in the ceiling of the theatre over the stage, which is made of lights and wire, to project different moving pictures on the stage floor. The stage floor can also open up and move to make different scenes and to make things appear and disappear more quickly when the lights go off, without the people wearing black coming on to the stage and taking them off like in some theatres. Marianne Elliot has made 3 other plays that I can remember seeing. A Curious Incident... is like all of them a bit. It is based on a book and has Luke Treadaway in it and is about animals and will make people cry, so it is very like War Horse. It is also about someone who relates to the world a bit differently, and the floor moves, like St Joan. And it is in the Cottesloe like Mrs Affleck was. But this is good and Mrs Affleck wasn't. Simon Stephens has made lots of other plays, and this one is also like some of them too. It is like A Doll's House because it is not a story that Simon made up. It is also like A Doll's House and Harper Regan – which he did make up – because it is about a mummy going away. And it is like Herons and Punk Rock, and Morning and other ones too, because it has a teenager who is different to other teenagers in it. These are called themes. The themes of The Curious Incident of the Dog in The Night Time are: understanding things; being happy; not being happy; things that grown-ups do, and love. The biggest theme is forgiveness. That is the biggest theme because it is the most difficult one to do. The play is very clever because they have made it very like the book even though the book is not a play at all. And a play is not really like a book very much when you are watching it. (Although you can buy the book of the play that says A Curious Incident of the Dog In The Night Time by Simon Stephens on it, or the book of the book, that says A Curious Incident of the Dog In The Night Time by Mark Haddon on it). So it is very clever that they seem to be similar when they can't be, really. And it is clever that it feels like it is a play by Simon or a play by Marianne when it is a book by Mark. Not everything in the play is good. Some of the movement sequences are not the sort of movement sequences that I like. That is not the fault of anyone specific. Some people will like them. I do not. The reason is because the actors pretend to be a door, or they pretend their hand is the keyhole of the door, and then another actor, being a real person, puts their finger through the pretend keyhole of the pretend lock and pretends their finger is the key. I think this is what they did. I am not sure that is a good sort of movement. I did like the bits where they threw Luke Treadaway sideways like they do in Café Müller, and also the bit where he was on some boxes that were pretend luggage on a train, but then the people came and took the boxes away except under his head and feet but he still stayed lying down. I don't know how he did that. He must be very strong. I also wasn't sure about the character of the teacher who keeps on appearing on stage but in a spot-light that means she isn't really there but is in Christopher's head, which is played by Luke's head. I think she might be made-up by Simon Stephens. She is nice, and you like her, but sometimes she is a bit too nice and is like Glinda The Good Witch in the Wizard of Oz. Which is a different sort of play that is from a book. Mostly, it is all very good. It is good like War Horse, because it has things in it like movement and swearing that used not to be allowed in the National Theatre, but now are allowed in the National Theatre. And now nobody minds those things any more, and I could get let my parents go and see this play and they would like it and they would say “Ooh, isn't it clever?” like they did when they saw War Horse and wouldn't mind the swearing, because it is realistic and people do swear. 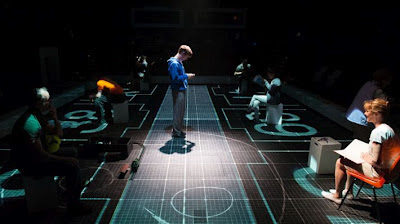 I think it is good that the National Theatre and Marianne Elliot and Simon Stephens and Finn Ross and Bunny Christie and everybody have made a good play that a lot of people can like. And I think it is good that has things in it that didn't used to be allowed and that people didn't used to like.